Closed toe Very Fine Dance Shoes. Receive your dance shoes WITHIN DAYS with FREE SHIPPING! Please check out our testimonials! Very Fine Ballroom Dance Shoes S9107 2"
Closed toe ladies smooth and standard ballroom dancing shoes, Very Fine Shoes & ballroom shoes for women! A great ballroom dancing shoe. Order US shoe size. 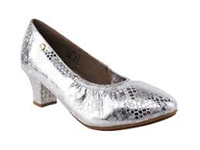 Please note: all ladies standard ballroom shoes from Signature/Party Pary & C Series do not have quick release buckles. For quick release buckle select a sku on a ballroom dancing shoe that has only a number or that starts with "SERA" or "CD." Scroll down after selecting the ladies standard ballroom shoes to click on each shoe for additional color & heel size options. The difference between traditional high heels and ballroom dance shoes is the balance you will get from your dance shoes, and still look incredible. You’ll find everything from beginner foxtrot and waltz dancer to the competitive professionals wearing our ladies standard ballroom shoes! Our dance shoes will be perfect for all! Select the right one for you, and if you have questions don’t hesitate to call us at 858-722-8088 where you will find great advice from trained dancers. Pick from many colors and styles of our ballroom dancing shoe and be assured you are getting a comfortable, stylish dance shoe you can be proud to wear! Shop today to find the perfect shoe! And don’t forget: FREE SHIPPING on ALL LADIES STANDART BALLROOM SHOES!